SINTOK: Deputy Prime Minister Datuk Seri Ahmad Zahid Hamidi yesterday announced that the Smuggling Prevention Unit (UPP) would be upgraded into a Border Security Agency. He said the new entity involving three core agencies, namely, the Royal Malaysia Police, Immigration Department and Royal Malaysian Customs Department would also involve several other enforcement agencies, as value added. “The policy paper on the proposal has been prepared and will be submitted to the Cabinet,” he said in his speech when opening a seminar on ‘Security and Border Management’ at Mu’adzam Shah Hall, Universiti Utara Malaysia (UUM), here. 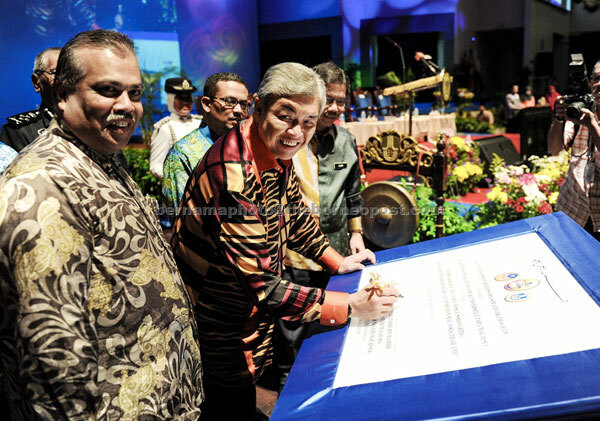 Ahmad Zahid, who is also Home Minister, stressed that no new allocation or posts would be created via the upgrading, but he promised to reward the agency’s officers and staff who exhibited excellent performance. “Believe me that when seizures of goods, smuggling of persons and human trafficking can be reduced, there will be some reward which I will give as incentive. This is my promise. “Change the approach, don’t ask first, but give first…no need to wait for a reward to motivate oneself. The Home Ministry and its agencies and others…we prove to the prime minister, we don’t ask before giving. We carry out, and the government will reciprocate,” he said. According to Ahmad Zahid, the nation lost up to RM7 billion a year due to the porous national borders, including losses on subsidised goods. He said goods worth RM38 million were seized from January to August this year by the UPP, up by more than 100 per cent from RM18 million in 2014 and RM17 million in 2013. In this regard, Ahmad Zahid said collaboration among the enforcement agencies must be strengthened, including translating the National Blue Ocean Strategy to avoid narrow thinking.